Clanmil Ireland is a not for profit voluntary organisation, registered as a charity and engaged in the provision of social housing. Our organisation received approved status as a Housing Association on 12th February 2002 and we are a member of the Irish Council for Social Housing. With a commitment to providing quality homes and services, our vision is that those who need a home will have a home. Our values reflect the culture of our organisation, with a customer focus, excellence in service provision, respect for all, a focus on partnership working, and a commitment to good governance. We are proud of the part we play in the provision affordable housing, with our Board and staff firmly believing that smaller Approved Housing Bodies play a vital role in maintaining the services provided by community based housing providers. We are committed to focussing our activities within the Leinster region, and with the nature of our operations and our engagement with tenants reflecting the ethos of a community based organisation. Our organisation is governed by a voluntary Board of Directors, who are committed to the highest level of governance and accountability in all areas of operation. We work to the Irish Council for Social Housing ‘Working for Good Governance’ guide and have signed up to the Voluntary Regulation Code. 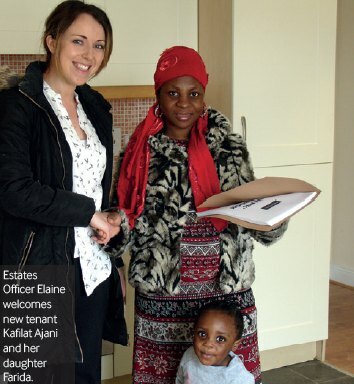 Having grown from a 68 unit housing scheme in Dundalk, we currently own and manage approximately 300 homes for social housing tenants in the four Dublin Council areas, and in Kildare, Louth, Meath, Laois and Wicklow. This includes general needs housing, housing for people with disabilities, and housing for the elderly. Clanmil Ireland has approved borrower status with the Housing Finance Agency, and was one of the first of the smaller AHBs to achieve this. The Association also has facilities with AIB to ensure that it maintains adequate liquidity to support business growth and operations.